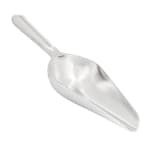 The American Metalcraft IS734 ice scoop is great for serving ice out of a bowl, bucket or ice machine for drinks, displays, and more. This utensil is 73⁄4 inches long, so it keeps the user's hands away from the ice for sanitary use. The American Metalcraft IS734 ice scoop has a 1⁄4-cup capacity.